Fars News photo of the aftermath of the bomb that killed Mostafa Ahmadi-Roshan. US Secretary of State Hillary Clinton railed Tuesday against Iran’s beginning of operations at its Qom uranium enrichment facility, which is buried deep within a mountain to protect it from bunker-buster bombs. Less than 24 hours later, the Deputy Director of the Natanz enrichment facility was assassinated when a bomb attached to his car exploded in northern Tehran. Iran is blaming Israel,citing similarities of this attack with two previous attacks on Iranian nuclear scientists, attacks in which Iran says the US also was complicit. “This step once again demonstrates the Iranian regime’s blatant disregard for its responsibilities and that the country’s growing isolation is self-inflicted,” Clinton said in a statement. “The circumstances surrounding this latest action are especially troubling,” Clinton said. Clinton rejected Iran’s assertion that it needed to enrich uranium to produce fuel for a medical research reactor, saying Western powers had offered alternatives means of obtaining such fuel but their offers had been rejected by Tehran. Remarkably, Clinton also called for Iran to return to the “P5+1” talks, apparently having missed Iran’s Foreign Minister stating last week that Iran is ready to return to these critical talks aimed at diffusing the tension over Iran’s nuclear technology. It appears that the US is having a bit of trouble with message management over its actions in relation to Iran. Over at Moon of Alabama, b reports on an embarrassing incident yesterday in which transcription from a “senior administration official” in the Washington Post got a bit too candid and had to be revised. The initial version of the story stated that “The goal of U.S. and other sanctions against Iran is regime collapse“, but the story has been changed to “The Obama administration sees economic sanctions against Iran as building public discontent that will help compel the government to abandon an alleged nuclear weapons program”. Oops! Iran said one of its nuclear scientists was killed on Wednesday by a magnet bomb fixed to his car by a motorcyclist and blamed Israel for the attack, intensifying diplomatic tensions the West over Tehran’s nuclear program. An Iranian university professor and deputy director at Natanz enrichment facility was killed in a terrorist bomb blast in a Northern Tehran neighborhood on Wednesday morning. The magnetic bomb which was planted by an unknown motorcyclist under the car of Mostafa Ahmadi Roshan Behdast, a professor at Tehran’s technical university, also wounded two other Iranian nationals in Seyed Khandan neighborhood in Northern Tehran. Ahmadi Roshan, 32, was a graduate of oil industry university and a deputy director of Natanz uranium enrichment facility for commercial affairs. Two daylight bomb attacks on the same day in Tehran in November 2010 killed one nuclear scientist and wounded another. 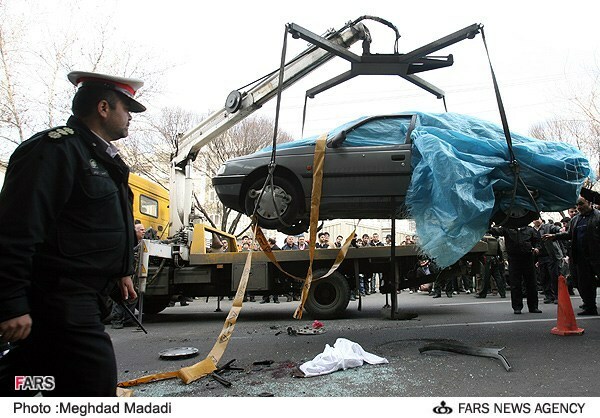 Physics lecturer Masoud Ali Mohammadi was killed in January 2010, when a remote-controlled bomb attached to a motorcycle exploded near his car in Tehran. Just as he has been happy to maintain and even extend Bush administration policies on indefinite detention, it appears that President Obama is happy to maintain the mushy state of oversight for actions inside Iran. Isn’t it amazing that in a battle that is often described as being one for hearts and minds, we use secret pieces of paper to make it legal to engage in the very same tactics we claim to be fighting? Glenn Greenwald also writes on this assassination. I won’t excerpt, the entire article is a must-read. @Jim White: I wonder what model of motorcycle MEK likes? The truth is that Israel will not be satisfied until it can create a war so that they may sell more arms and kill more ‘non-jews’. Why this country is in the thrall of Israel is beyond common sense or reason. It just takes a bit of practice… “birth pangs of democracy” and such, but in perfecting this craft, it really gets easier. Seems to me I recall someone in W’s admin saying just that, they were “creating our own reality” at the beginning of this GWOT. Rather incredible that one little illusion, built upon and nurtured, can metastasize over 1/2 century seemingly w/out interruption, carrying so many people along for the ride. I think I’m experiencing amnesia and deja-vu at the same time… I’ve forgotten this before. I’ve lived in Albuquerque about 7 years. Generally, in early January, we have daytime temps around 30 degrees. This year, I’m wearing light pants and T-shirts, we’re hitting 50+ degrees. Much wider abnormalities like this across north America… the Dakotas seeing 60+. It’s almost like life here in our techno society is one, big, extrapolating KOAN, and nobody knows it yet. Didn’t Panetta just say about two weeks ago on the public airwaves that Iran DOES NOT HAVE a nuclear weapon? I’m positive he did. I’ll go try to find the link. weaponry is not the goal. It would be ironic if the regime was telling the truth, which, for credibility testing, is much like Saddam and his WMD’s. The authors basically acknowledge Iran doesn’t need a bomb, doesn’t want a bomb, and doesn’t want to be in position where it needs a bomb. Iran will have to be pushed by “regional and international developments” to build one. In the process, they also conclude that Israel can live with an Iranian bomb, and in fact their situation ends with Israel in a substantially stronger position than before Iran has the bomb (their simulation ends with Israel entering NATO, Turkey leaving, Iran isolated, and Russia closer to Europe. The only downside is that Saudi moves toward its own nuclear program, but the US could easy delay or prevent that from going too far). I’m surprised no one has picked up the conclusions of this simulation yet. I’m surprised I haven’t seen anyone delve into this report yet. My take on the situation is there seems to be two agendas at play and the US is being played like a cheap fiddle. The Israelis don’t want Iran to have nukes because then they might have to negotiate honestly. It’s easy to be the biggest bully in the room with a 800 lb. gorilla on a leash (nukes) and another in your back pocket (US) but level the playing field and Israel might find itself with no ace up its sleeve. The other is oil, or better put the price of oil. As long as the sabre rattling keeps going on the price of oil keeps going up, and who’s to benefit the most… Wall Street. If Israel were to attack Iran and Iran mined the Strait of Hormuz to stop the main flow of oil Wall Street stands to make Millions if not Billions, so between AIPAC and Wall Street pulling all the strings and Congress the lapdog for both the situation can only get worse. So the useful question is: who will profit from such a war? The oil companies have already jacked up gas prices due to the turmoil to add to he already-obscene profits. If the AIPAC chickenhawks are able to put our kids’ lives at stake while they profit from it, directly or indirectly, via the inevitable use of contractors, so much the better in their view. I’m pretty sure Bibi needs this to stay in office as a wag-the-dog scenario, and is assuming that the RW Wurlitzer will pressure Obama into protecting Israel from the consequences of what Bibi wants. The Iranians aren’t stupid, they see how hands-off we became once the DPRK and Pakistan had nukes, the precedent has been set. Oil is most certainly in play. Leverage fear of Iran to extort Saudi’s to keep petrodollars as the only acceptable currency. To me this is the biggest factor in all of the kabuki going on. With Iran selling oil on its Iran oil bourse in anything but US dollars the world might figure out that the US dollar won’t even make good toilet tissue. I would love to be in the room when China tells Geithner to go pound sand over sanctions to Iran. @Quanto: I would love to be in the room when China tells Geithner to go pound sand over sanctions to Iran. *heh* No doubt… U.S. Treasury Secretary Timothy Geithner and Chinese leaders pledged Wednesday to build economic ties but Beijing gave no sign it would relent in its opposition to American sanctions on Iran’s oil industry. Don’t forget the Russians. It’s why a real resolution with teeth will fail, because a UNSC veto from either one of these governments will doom the resolution. In addition the T-bills held by the Chinese used to finance the wars [thanks a lot, Shrub] can be used to leverage our departure. It goes back to who will profit. If we’re taken down a couple more pegs, the Chinese and Russians will move in to fill the void. I can see China opposing the sanctions but it’s to Russia’s advantage to have the price of oil keep climbing, their oil output is at record levels since 1987. I’m hoping for a piece on the latest in Pakistan. If you get some time. @ryanwc: Coming up very soon!